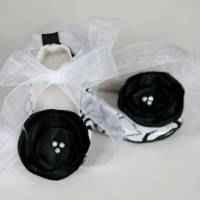 Roses are all the rage on the runways, and they show up in these baby and toddler girl ballet slippers with a charming brocade of black and white with silver threads for a bit of glam. Perched on the toes of these black and white brocade baby and toddler girl shoes are handmade silk flowers adorned with freshwater pearls and a few feathers for good measure. 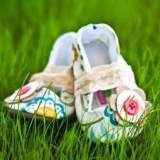 These brocade baby and toddler shoes are perfect for a special occasion, but they will make any wearing an occasion. Each pair of shoes is handmade. Some shoes feature round pearls and others feature oval pearls. Measure your child's foot from the end of the big toe to the heel because some children's feet do not conform to the standard age measurements below. The sizes below list your child’s foot measurement. Actual shoes measure ¼ longer than the measurements below for comfort and growing room. If you are at all concerned that the baby or toddler girl black and white handmade shoes will be too small, please order the next size up. 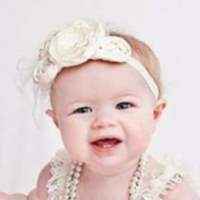 Your baby or girl can always stuff a couple of cotton balls in the toe. 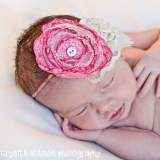 Caution: These black and white flower and feather baby and toddler girl handmade flower girl shoes are embellished with small parts. Be careful and watch when your baby wears them. 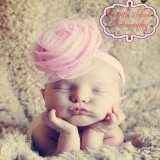 Note: Each pair of black and white with silver baby and toddler girl feather ballet slippers is handmade individually, and so there will be slight variations from the photos. 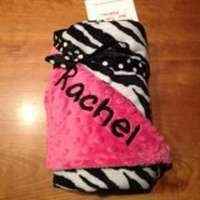 Each pair of black and white baby and toddler girl feather ballet slippers is handmade in the United States.